At 43 minutes, last week’s Tustin City Council meeting was the shortest of the year and one of the shortest on record. Even Mayor Al Murray joked about reaching the business and committee reports in record time. The Presentation of Colors by The American Legion Post 227 preceded by Furhan Zubaini, Darul Falah giving the invocation and a quick lesson on Islam took up a good portion of the regular session. A great presentation on the life of Tustin resident Evelyn Furtsch Ojeda, who turned 100 years old, was made. This lady, an Olympian in her younger years, has led a remarkable life that was told in a silent PowerPoint presentation. 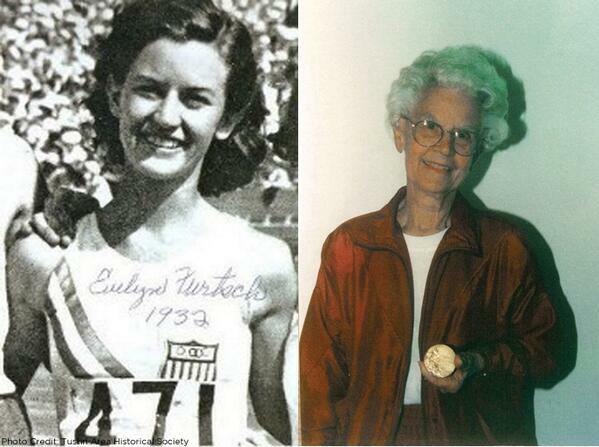 Evelyn is the oldest living Gold Medalist of the 1932 Olympics. It is folks like her that make Tustin the great town it is. Happy Birthday, Evelyn! The sole Public Hearing Item on the allocation of Community Development Block Grant funding was continued, at staff request, to the May 6th city council meeting. Item 5, Extension of Lease Agreement for Operation of the Food/Beverage Concession at Tustin Sports Park, was pulled from the Consent Calendar at Councilwoman Gomez’ request. The rest of the Consent Calendar, including the award of construction projects on Warner and Armstrong Avenues, was passed without comment. The food and beverage concession issue began with a presentation on the concession itself. According to the presentation, the concession has had a difficult history with three operators attempting to fulfill lease agreements. The current operator, Express Sports Cafe, took over in October 2000 and has operated the concession ever since. The presentation included the challenges now facing the concession operators including the ability of sports park patrons to order takeout food delivered to the park Really? Has anyone ever done that? A bigger challenge is the fact the concession does not have a grill and cannot make the simplest of foods such as hot dogs and hamburgers, let alone anything exotic like a bratwurst. Other so-called challenges include the time honored tradition of bringing a picnic lunch to the game. The presenter then wasted time telling us what we already knew – Tustin Sports Park is used for sports. All in all, the presentation could have been shortened to about 30 seconds. But, some people like to hear themselves talk. In the end, Councilwoman Gomez still had to ask her questions regarding the closing of the concession for fundraising activities. It was pointed out in the presentation that local groups could ask the concession to close so they could have fundraisers, presumably during tournaments and games. Gomez asked how that would work. Her concern was, of course, that the concessionaire makes a living off the sales of the concession and would lose money when closed. It was explained that any group asking to close the concession stand so they could run a fundraiser is required to pay a $200 per day fee to the owner. Satisfied with the answer, Gomez joined the Amigos in voting in favor of the lease renewal. With no reports from staff, the Mayor dove right into council comments. I won’t bore you with the details other than to tell you that the Podiatrist Councilman reported the fantasy group, ACCOC, is drafting pension reform policy based on the “excellent” negotiations they held in Tustin. If by excellent they mean how badly they screwed their rank-and-file employees while taking “excellent” care of the executive management, then yes, it was excellent. There is no Planning Commission meeting tonight. I apologize for being AWOL this past week but, as you can see, not much happened anyway. Well, there is one thing worth mentioning. We noticed lame duck Councilmember John Nielsen was absent – again. This from the guy who joined Hizzoner, Jerry Amante, in lambasting former Councilwoman Deborah Gavello for her every absence. I guess once you’ve sung your swan song, you don’t worry the details. As far as we are concerned, Nielsen continues his history of doing nothing on the Tustin City Council, whether he is present or not. Posted on April 22, 2014, in Local Government, politics, Tustin City Council and tagged 1932 Olympics, al murray, City Council Agenda, concessions, conspiracy theories, evelyn furtsch ojeda, john nielsen, public hearing, tustin sports park. Bookmark the permalink. 1 Comment.